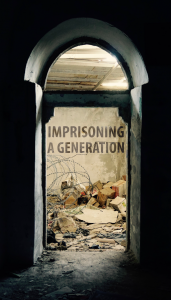 To mark Palestinian Prisoners’ Day 2019, on Wednesday 17th April you are invited to a special screening of this recent important film about the struggles of Palestinian child prisoners in apartheid Israel’s jails. The film will be shown at 9pm in Bennigans Bar, 13 John Street, Derry. This film follows the stories of four Palestinian children who have been detained and imprisoned by Israel. Their perspectives, along with the voices of their families, combine to create a lens into the entangled structures of Israeli oppression that expand well beyond the prison walls. We invite you to come along and learn more about the plight, struggles, hopes and fears of generations of young Palestinian political prisoners whose lives have been invaded by Apartheid Israel, even as Israel holds the entire Palestinian people captive under occupation or in enforced exile. Hosted by the Derry branch of the Ireland-Palestine Solidarity Campaign in association with Bennigans Film Club.